“Hummingbird cake?! What on earth is that?” Is that what you’re thinking right now? That’s definitely what I thought the first time I ever heard the name. Turns out, a lot of my coworkers felt the same way. 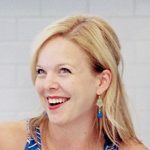 Almost every time I passed around the cupcake menu for birthday selections, the question was inevitable: what is hummingbird cake? This cake is fresh and fruity with a definite tropical flavor, thanks to the combination of banana, pineapple, and coconut. 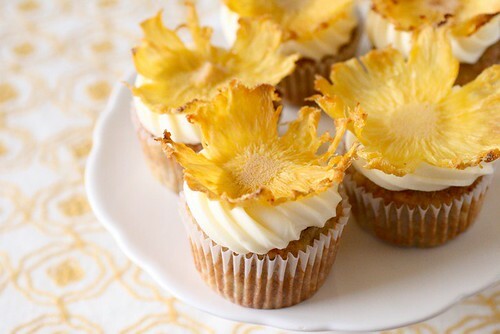 It is finished off with cream cheese frosting (a sure sign of something good) and if you want, dried pineapple flowers. Most recipes I have seen also seem to include nuts mixed in to the cake or on top of the frosting, but I omitted them. I’m still of the mind that many perfectly fine desserts are ruined by adding nuts. Reading through the ingredient list, I knew immediately that I would love this cake. I’ve been dying to try it and was ready to just make it just because when a coworker finally chose it from the list. (Thanks, Chen!) Apparently this cake seems to be traditional around Mother’s Day, though my attempts to research any real connection between the two were unsuccessful. I am guessing it is simply because this tropical, fruity cake is so well suited for a springtime celebration. The dried pineapple flowers are a nice touch and a lot of people commented on how neat they looked. I plan to do a separate post on how to make them very soon. Preheat the oven to 350˚ F. Line cupcake pans with paper liners. In a medium bowl, combine the flour, baking soda, salt and cinnamon; whisk together and set aside. In the bowl of an electric mixer, combine the butter, vanilla, and sugar and beat until blended and smooth. Beat in the eggs one at a time, mixing well after each addition. Mix in the mashed banana. With the mixer on low speed, mix in the dry ingredients just until incorporated. Gently fold in the pineapple, nuts (if using), and coconut with a spatula until evenly mixed. Divide the batter between the prepared liners, filling each about ¾ full. Bake for 20-22 minutes, until a toothpick inserted in the center comes out clean. Let cool in the pans 5-10 minutes, then transfer to a wire rack to cool completely. *If you are big on frosting as I am, you may want to increase the quantities by 50%. That is what I typically do for a batch of 24 cupcakes. I usually end up with some left over, but I would rather have too much frosting than not enough!